Sceptical about the yield improvement to be gained by investing in new machinery, monitor farmer Richard Reed has instead opted for buying mature tractors at modest prices to give his business ‘a competitive edge’. This comes at a time when managing fixed costs is of increasing importance, according to AHDB knowledge exchange manager, Tim Isaac who spoke at the recent AHDB Monitor Farm Conference in Milton Keynes. He said: “If you look at benchmarking figures for last harvest, the range in variable costs was around £40/t, whereas the range in fixed costs was around £100/t. Speaking at the conference, Richard Reed who farms 405 hectares (1000 acres) of his own at Ancroft Hall Farm, Berwick and contracts a further 405 hectares (1000 acres), provided some reasons behind his move to more experienced machines. This was largely driven by a hefty rise in the cost of machinery over the past three decades which has not been matched by an increase in commodity prices. “The price we have got for our produce has not really changed a lot over the past 30 years” said Mr Reed “The big difference is the cost of production with a 200 horsepower tractor costing around £30,000 in 1982 and the same size tractor costing £90,000 now. “Myself and my father just felt that the price of new kit was so expensive and at a time when the contracting side of the business was growing we didn’t want to dive in and spend £100,000 on a new tractor, not knowing whether or not we would get enough work. “So we try and keep the average price we pay for our machines at the £30,000 mark, which is the opposite to what most of our competitors are doing. Responsible for cultivation, two 325hp Ford Versatile tractors carry the most age, but so far have proved reliable and efficient, according to Mr Reed. Of the six tractors on-farm, the average age is 19 years old while the combines, sprayers and telehandlers range from 10 to 18 years old. Although his machines average around 8855 hours, Mr Reed insists that the skills of his core staff keep downtime to a minimum. “Ultimately staff is one of the most important parts of what we do. We have two very good members of staff who have been with us for 25 years. See also: Methane powered tractors; fashion or future? “They are great in the workshop and they are very much behind the system which helps in keeping everything running smoothly. Keeping tractor hours manageable also helps with keeping machines in working order, according to Mr Reed. On-farm, tractors average a modest 500 hours annually, which he accepted is lower than most tractors in the UK. “We are quite happy with the numbers of hours tractors are doing per year, I wouldn’t like to be doing many more or we would run the risk of having more downtime,” said Mr Reed. When questioned about the comparative fuel usage between old and new machines, Mr Reed said he noticed very little difference on-farm. 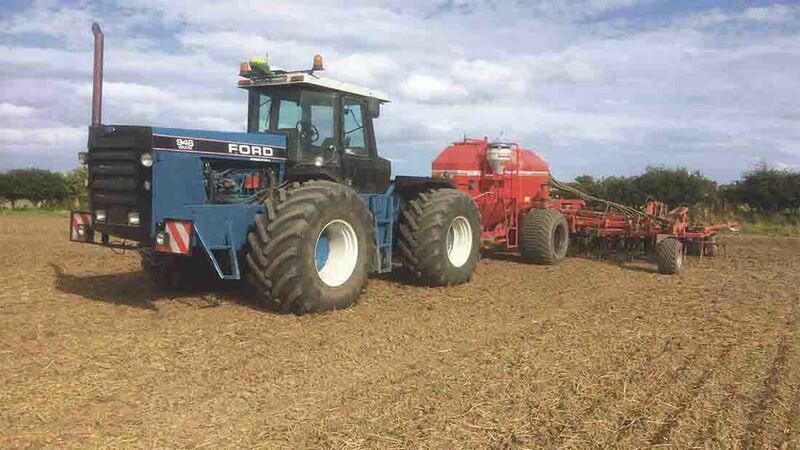 This was backed up by AHDB North East manager, Harry Henderson who said Nebraska comparison tests had concluded minimal differences in fuel usage between the Ford Versatile and the modern equivalent. When working out his spend on machinery compared to the equivalent spend if he was to buy new, Mr Reed worked out that production would have to significantly increase in order to justify greater investment.